A$AP Mob are planning to release Cozy Tapes Vol. 2 this year, and just released the video for “RAF.” It’s got A$AP Rocky, Playboi Carti, and Quavos of Migos. (The original version of the song also features Lil Uzi Vert and Frank Ocean but the video version doesn’t.) Watch below. 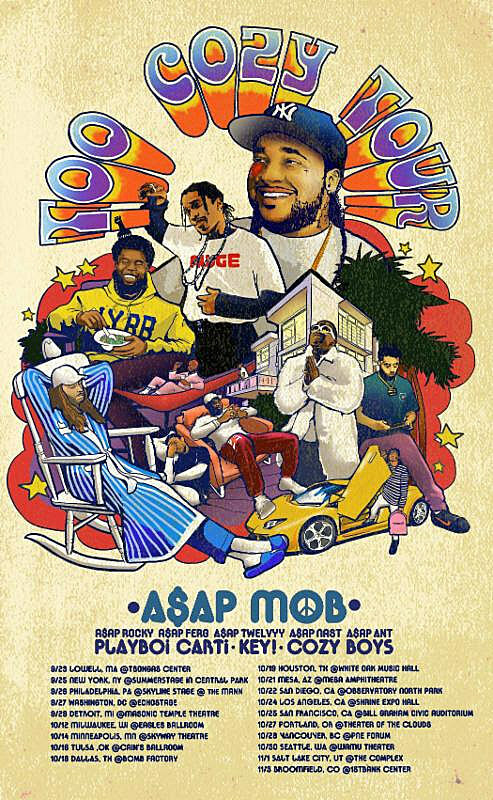 A$AP Mob (Rocky, Ferg, Twelvyy, Nast and Ant included) have also announced a headlining tour with support from Playboi Carti, Key! and Cozy Boys. The tour includes a big show in A$AP Mob’s hometown of NYC on September 25 at Central Park SummerStage. Tickets for that show go on sale Friday (7/28) at 10 AM. All dates are listed on the tour poster above. A$AP Ferg also has his own mixtape on the way and a handful of upcoming solo shows, including Peter Rosenberg’s Peterpalooza on 7/27 at Knockdown Center (tickets), Warm Up on 8/5 (tickets), and Atlantic City with Future on 8/24 (tickets). A$AP Rocky and Playboi Carti are both on the new Lana Del Rey album. Rocky is also on the Tyler, the Creator album that came out the same day.